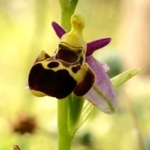 One of several species of bee orchids to be found on Skopelos, distinguished by the clear spot, umbilicus, seen at the centre of the rounded lip. They are most commonly found in olive groves ;if one is found is found, there are likely to be many. The presence of orchids in an olive grove are an indication that the land has been well managed.